"Libraries aren't supermarkets; they're places of cultural importance, where magic happens and where dreams begin. Or at least they should be" - Ann Cleeves. It is possible to step empty-handed into a library, and find fragments and pieces of your soul among the endless bookshelves. It happened to me when I was very young, and randomly picked "Little Women" off the shelves. Something changed, and I've never been the same since. Therefore, it is wrong to think that a library is a place that will only lend you books. On the contrary, a library is a place where you can find yourself. And this is really what the best part of this book is about. 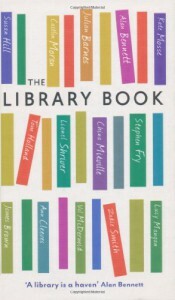 Anita Anad writes about how the library books built her character, Val McDermid describes how the library became her second home, and Alan Bennett describes the overwhelming feeling you get, when confronted with a bursting bookcase. But the true star of this anthology is Stephen Fry and his deeply moving essay "Have You Ever Heard of Oscar Wilde?". Not only is it a lovely story about how a young boy came to love literature - it is also a beautiful tale of how books can lead you from denial to understanding. Fry simply tells how Oscar Wilde lead him to a life-altering revelation. Other parts of "The Library Book" are more political, more insisting and more desperate. The intrusive cries of how libraries are essential to our modern society don't really make the best of reading material, and do not seem to defend the libraries in a convincing manner either. I adored the lighter parts of this book, as they reminded me of the fond memories I have had within the walls of the library - which is the point of this book, after all.